Now that the hubster and I have made it to our new city, I’m starting to pick up on costuming for this year. I have a lot of projects in the works for 2015 and some of them are rather far along right now. I have been able to post a couple of pages up on some of my progress (linked below), but several others are currently underway. Agent Carter – As soon as I watched the pilot I knew I had to make her blue suit with signature red hat! This is a wonderful show, and I’m rather sad that S1 is only eight episodes long. Peggy is a great character who has developed so much more since Captain America (See this and the Marvel short: “Agent Peggy Carter”). So far I have the shoes, nail polish, lipstick (all SA), and the hat has been ordered. The pattern I’m using for the suit is on its way. I’ll have to pick out fabrics and alter the pattern, but this one is coming along nicely. I hope to have it done by next month for All-Con. Black Widow – I’m starting to collect pieces for The Avengers version and the Ironman 2 version. I have sleeve patches, the fingerless motorcycle gloves, and I’m sourcing the clips, discs and holders, and belt buckle to have them 3D printed for the Avengers version. Boots will be an issue and the suit will be pain as well. As for Ironman 2, I have a patch, the outer fabric for the suit (I’m having to layer it to get the right effect), and I’m sourcing the pieces for 3D printing. I may have to learn molding for the belt. Ugggggh. I hope to have it done by this year. 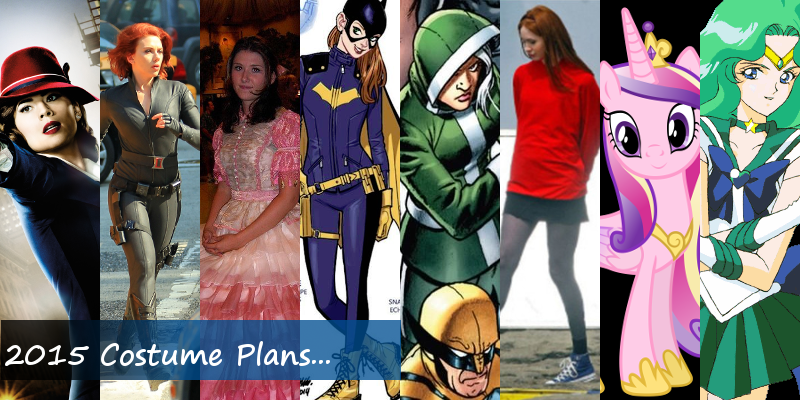 Amy Pond – This one is fairly simple. I purchased the SA hoodie from a friend of mine and I already have the navy hi-top Converse. I purchased the SA OPI Nail Lacquer (long since discontinued) on ebay. All that’s left is to figure out a skirt situation, buy some charcoal tights, get the wig, and add the headband. Not too shabby. I will have this one done for All-Con as well (I hope – the shoes are in storage atm). Kaylee Shindig Dress (Top) – I’m remaking the bodice for this dress as the current one had some shredding of the organza on a panel. Rather than fix it I’m going to re-do it with much better fabrics. I’m waiting on the silk organza for the bodice to arrive. I’ve gotten a pink antique dupatta (veil), the fringe to knot, tassel fringe, and the ruffled trim. I’ll be making a page for that soon. Those are the ones I’m currently working on. I’ve been collecting reference images for New 52 Batgirl so I hope to get started on that soon. I’ll update as I go along, and be sure to check out my Facebook and Instagram for the latest! Next 2015 Charity: Extra Life!